This post has already been read 2097 times! KEARNEY – At 85 years old, Earl Rademacher is a pretty reserved guy. The soft-spoken retiree enjoys Kearney life with his wife JoAnn, who he married nearly 59 years ago, and doesn’t shy away from a good conversation – although he’ll never be the first to bring up his own accomplishments. “My parents brought us up to be humble,” his daughter Jane Strawhecker notes. 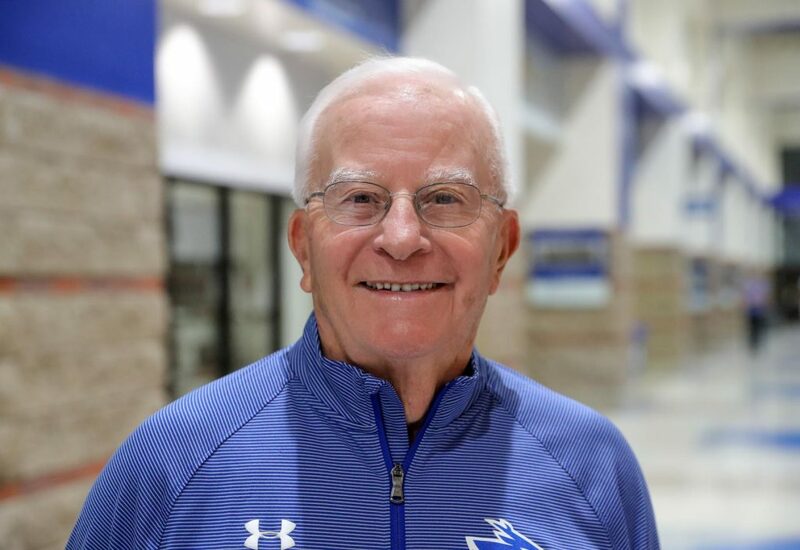 Instead of talking about himself, Rademacher would rather discuss his grandsons’ performance at the state tennis tournament or the University of Nebraska at Kearney volleyball team’s stellar season. “I can see my dad get really passionate about two things – tennis and UNK,” Strawhecker said. Those passions began developing at the same time, when a young man from rural Loup City followed his mother’s advice and enrolled in college about an hour down the road. 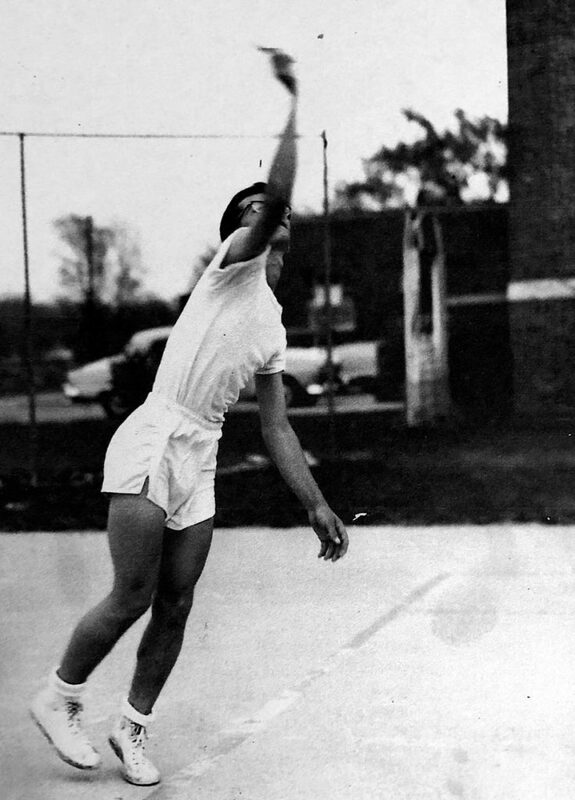 Earl Rademacher played tennis for UNK in the early 1950s, earning the No. 1 singles spot as a senior. He still schedules a weekly doubles match with friends. Rademacher wasn’t a tennis player when he arrived at the Nebraska State Teachers College at Kearney in the early 1950s, but a buddy from Grand Island was. The two played together almost every day and Rademacher enjoyed the sport, so he took a class led by the college’s tennis coach. He joined the team as a sophomore and competed for three years, earning the No. 1 singles spot as a senior. Not bad for someone who didn’t pick up a racket until college, JoAnn notes, doing a little bragging for her husband. Rademacher’s younger brother Bob also played college tennis in Kearney, marking the beginning of what has become a family tradition. 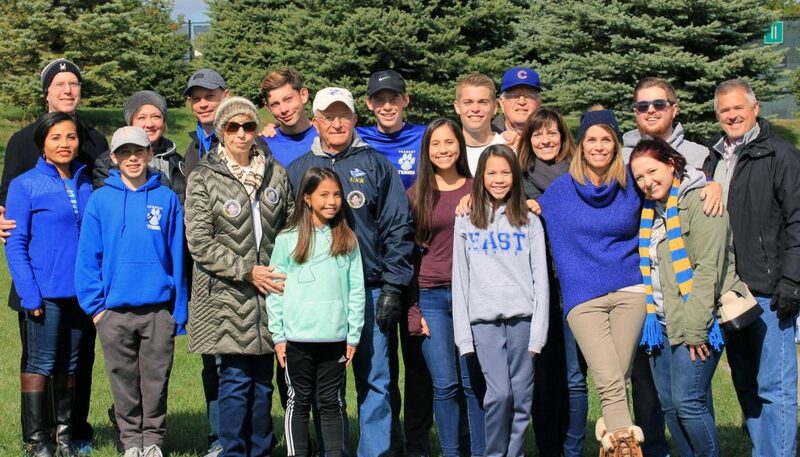 Strawhecker and her three siblings – Steve, John and Susan – grew up with the sport, honing their skills at an early age by hitting balls off a wall at Apollo Park and participating in a Sertoma youth program where their father served as a volunteer coach. “It’s something he taught us when we were old enough to bounce a ball and hold a racket in our hands,” Strawhecker said. All four siblings went on to play at Kearney High School, where Steve won a Class B doubles title in 1979, then at Kearney State College, which became UNK in 1991. They’ve also been involved as instructors with the local youth tennis program and competed in recreational leagues. “My dad’s love for tennis has been a prominent part of our family,” said Strawhecker, a member of the Kearney State team from 1982-85. 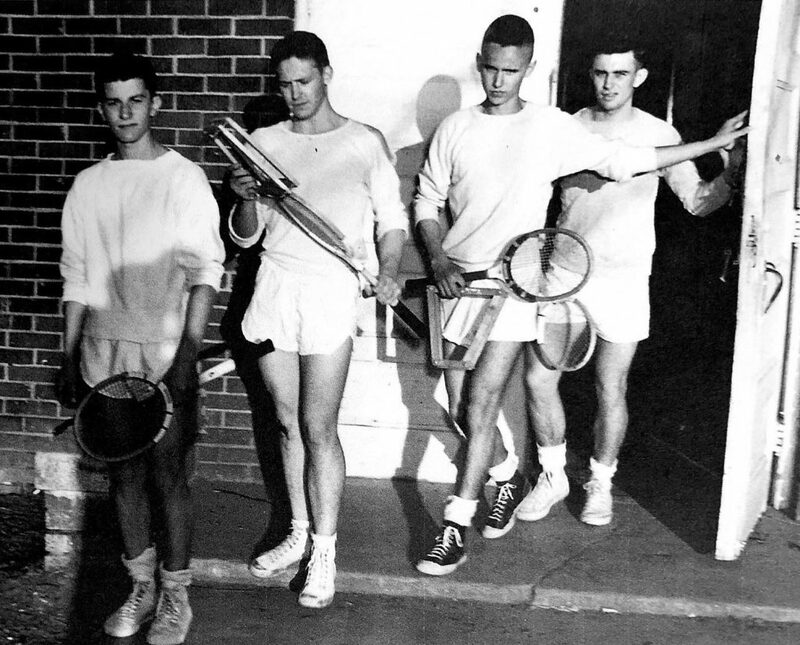 Now, a third generation is carrying the torch as several of Rademacher’s grandchildren play competitive tennis. Steve’s daughter Bianca, a junior at Lincoln East High School, was runner-up in No. 1 singles during the Class A girls state tournament last spring. Not to be outdone, John’s son Max and Strawhecker’s son Kaleb teamed up to take second in No. 1 doubles at last month’s Class A boys state tournament in Omaha, setting a Kearney High record with 35 victories along the way. Rademacher still works in a weekly doubles match with a group of Kearney friends, but he’s happier playing the role of spectator these days. “Watching the grandkids play tennis, that’s what’s most fun,” he said. The Rademacher family’s contributions to the sport and continuous effort to promote tennis were recognized earlier this month when they received the Nebraska Tennis Association Family of the Year Award during a banquet in Omaha. Kearney High tennis coach Troy Saulsbury applauded their commitment to tennis and knack for introducing others to the game. “They’re bringing new people into the fold and getting more people involved. It’s fun to see,” said Saulsbury, who serves on the Kearney Tennis Association Board of Directors with Strawhecker and her brother John. Rademacher was also a longtime board member. Saulsbury, a member of the Nebraska Tennis Association awards committee, credited the family for helping develop Kearney’s strong interest in the sport among both adults and youths. Of course, Rademacher and his wife weren’t looking for any accolades. Rademacher’s love for UNK extends beyond his family’s playing days. He also had a 37-year professional career at his alma mater. After graduating from the Nebraska State Teachers College in 1954, Rademacher was drafted into the U.S. Army and spent 1 1/2 years stationed in Japan following the Korean War. He earned his master’s degree at the University of Northern Colorado and worked as a teacher and coach in Douglas and York before award-winning poet, longtime English professor and friend Don Welch recruited him for a position back in Kearney. Rademacher, who started as an assistant to the registrar and director of admissions, worked his way up to chief financial officer (vice chancellor for business and finance) within 15 years. He also served as interim president from August 1982 until March 1983 and spent six months as interim director of facilities before retiring in 1997. He worked for three different presidents, two chancellors and a school that changed names twice. There were other career opportunities over the years, but Rademacher turned them all down. Strawhecker, a professor and assistant chair in UNK’s Department of Teacher Education, isn’t surprised by her parents’ dedication to the university. “That’s part of who they are,” she said. The sign on their front door lets you know they’re Loper fans who are always ready to discuss the latest theater performance or athletic achievement. JoAnn will tell you about the Orphan Train musical UNK presented last month, Mary Katherine Wolfe’s development on the volleyball court and how excited she is to watch Kearney High graduate Kanon Koster play basketball for the Lopers. They’ll be in the stands tonight for the NCAA Division II volleyball tournament and have even been known to plan their travel around UNK home games. “I think it’s important to provide support for the teams,” her husband added. Time may pass, but certain passions never go away. At 85 years old, Rademacher is proving that. “It’s pretty inspirational for the younger generation to see what it means to be loyal and dedicated to your alma mater,” Strawhecker said. Earl Rademacher, left, played tennis for UNK in the early 1950s, earning the No. 1 singles spot as a senior. He still schedules a weekly doubles match with friends. 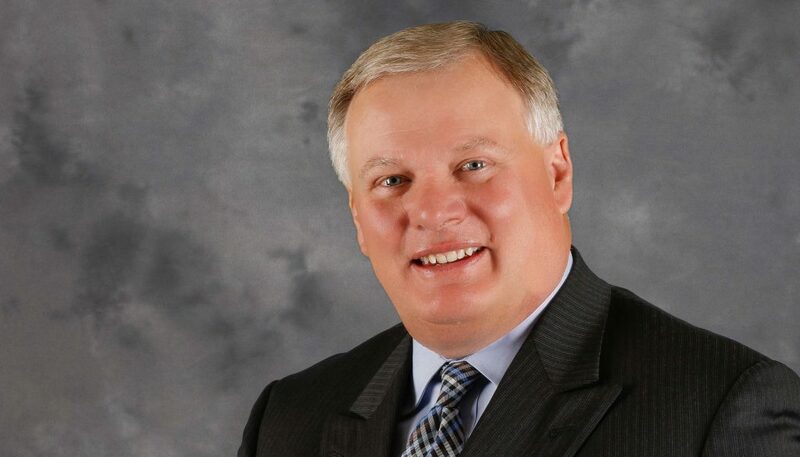 UNK Chancellor Doug Kristensen called Rademacher a Loper through and through. In 2004, UNK recognized Rademacher’s contributions to the university by naming a plaza near the College of Education building in his honor. He has also received the Cope Cornerstone of Excellence Award, which is presented annually to individuals who have provided significant service, support and promotion of UNK, the greater Kearney area, state of Nebraska and higher education. The award, approved by the University of Nebraska Board of Regents, is the highest campus honor at UNK.